After the Midland Railway took over the Birmingham & Gloucester Railway the GWR decided that it needed its own line from Birmingham to Bristol so it built a rather circuitous line that eventually linked Birmingham Snow Hill with Cheltenham via Stratford-on-Avon. Most of this line lies outside of Worcestershire with the northern part being in Warwickshire and the southern end in Gloucestershire. However a section around Honeybourne is in Worcestershire. The line from Birmingham to Stratford-on-Avon is still part of the national railway network but the remainder is closed. Passenger services ceased in March 1968 and freight on 25th August 1976 following the derailment of a freight train at Winchcombe . However the Gloucestershire & Warwickshire Railway Society now own part of this line including Toddington and Broadway and operate preserved steam and diesel trains. Honeybourne to Stratford-on-Avon was opened by the Oxford, Worcester and Wolverhampton Railway on 11th July 1859 and on to Hatton in 1861. There were stations at Long Marston and Milcote. Honeybourne Junction was a large station forming an interchange between the lines from Worcester to Oxford and Stratford to Cheltenham. This was reflected in the station name board that read "Honeybourne Junction for Stratford-on-Avon Branch Warwick Leamington Birmingham Broadway Winchcombe and Cheltenham". Honeybourne Junction closed 5th May 1969 but has since been reopened as simply Honeybourne. On the section from Honeybourne to Cheltenham there were stations at Weston Subedge, Willersley Halt, Broadway, Laverton Halt, Toddington, Hailes Abbey Halt, Winchcombe, Gretton Halt, Gotherington, Bishop's Cleeve, Cheltenham Malvern Road, High Street Halt (closed 30th April 1917) and Cheltenham Spa St James'. The local service from Honeybourne to Cheltenham was withdrawn on 7th March 1960 and the remaining stations were closed. 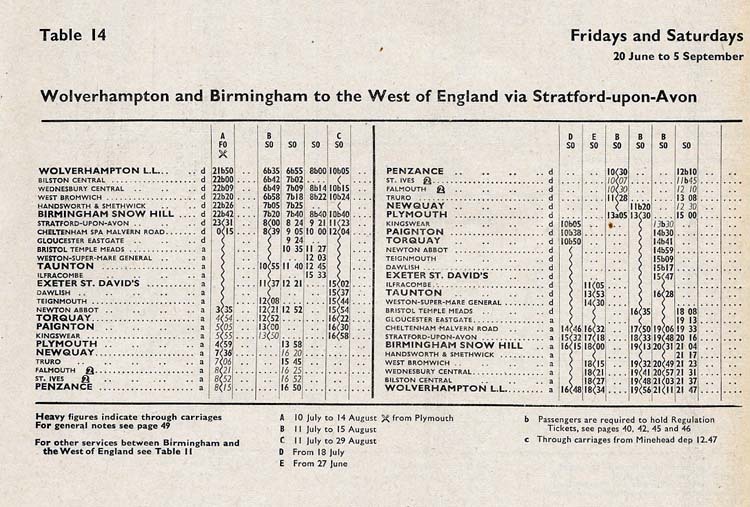 This is an extract from the 1964 Western Region timetable and shows the five summer extra passenger trains that were scheduled to run from Wolverhampton to the West Country via the Stratford on Avon and Cheltenham line (via Honeybourne). These trains were scheduled for steam haulage between Wolverhampton and Bristol and a 'Castle' class 4-6-0 was the usual motive power. No.5054 'Earl of Ducie' was noted in charge of the 8:00 Wolverhampton to Ilfracombe - being the last recorded working for this Worcester based engine. The 'Railway Observer' reported that No.5056 'Earl of Powis' had charge of the 10:05 to Ilfracombe on 8th August 1964. There was also a special station at Cheltenham Racecourse that was only used on race days, closed 19th March 1976. The section from Honeybourne to Toddington opened 1st August 1904, to Winchcombe 1st February 1905, to Bishop's Cleeve 1st June 1906 and Malvern Road Junction, Cheltenham 1st August 1906.